Viet Nam and Switzerland have agreed to speed up the free trade agreement negotiations between Viet Nam and the EFTA States (Switzerland, Norway, Iceland, and Lichtenstein). 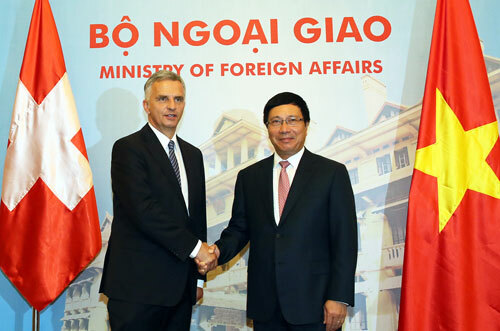 The agreement was jointly made by Deputy PM, FM Pham Binh Minh and Swiss FM Didier Burkhalter at the press briefing after their talks in Ha Noi on June 2. Deputy PM, FM Minh hoped that it will be a balanced, high-quality agreement which takes into account development levels of the relevant parties. Once signed, the agreement is expected to open up new investment opportunities for businesses of the two countries and the two regions as well. 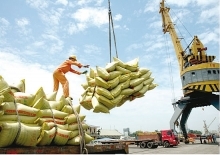 Switzerland is an important European trading partner of Viet Nam with the two-way trade volume of US$700-800 million per year. At the talks, both sides expressed their pleasure at the positive development of the bilateral ties in various fields like politics, economy, trade, investment, development cooperation and education and training. The two countries have regularly exchanged delegations at all levels, maintained effective mechanisms such as political consultation and human rights dialogue. The two sides agreed to further enhance the bilateral relations and coordinate in organizing a number of activities to celebrate the 45th anniversary of diplomatic ties in 2016. 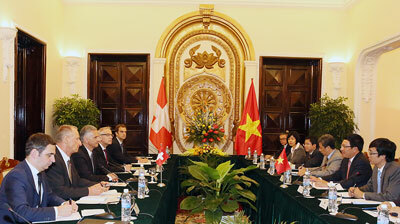 Deputy PM, FM Minh welcomed the Swiss Government’s decision to open its Consulate General in Ho Chi Minh City. The two countries agreed to continue creating favorable conditions for their investors, expand cooperation in transport, science and technology, healthcare, culture, tourism, and people-to-people exchanges. Deputy PM, FM Minh highly valued Switzerland’s official development assistance for Viet Nam over the past years, focusing on environment, workforce training, urban development, poverty reduction, and rural development. The Switzerland-financed projects have been fruitfully deployed in Viet Nam, contributing to the country’s socioeconomic development achievements and the realization of many of the UN-led millennium development goals, said Deputy PM, FM Minh. With regard to regional and international issues, including the East Sea situation, both sides have shared the same stances on many key issues, supported each other and agreed to foster coordination at international forums. They underlined the necessity of ensuring peace and stability, maintaining security, safety and freedom of navigation and aviation in the East Sea. All disputes must be settled through dialogue and negotiation on the basis of international law, especially the 1982 UN Convention on the Law of the Sea and the Declaration on the Conduct of Parties in the East Sea. Speaking at the press briefing, Swiss FM Didier Burkhalter said it is his first visit to Viet Nam where he could feel Vietnamese people’s resolve for development. He affirmed that his visit aims at beefing up partnership with Viet Nam, not just in economy but also in security and international law. Thanks to the spirit of friendship and mutual respect during their talks, he said he frankly discussed all issues of common concern, including the protection of intellectual property, with Deputy PM, FM Minh. The Swiss diplomat also noted the positive progress in Viet Nam’s human rights and praised the country’s ratification of the UN Convention against torture and other cruel, inhuman or degrading treatment or punishment./.